Cesar Castro has 7 brothers and sisters. He is the only one of his siblings to pick shells to contribute to his family´s income. 2013. The mangroves of the Cayapas Mataje Reserve are the tallest in the world. The dashing roots and branches of the trees grow in shapes and forms that seemingly defy any logic. They are the most perfect example of the infinite wonder and capriciousness of nature. 2014. Elisa Castillo lives with her aunt. She stopped going to school at age 15. She picks shells to contribute to her household´s economy. 2010. 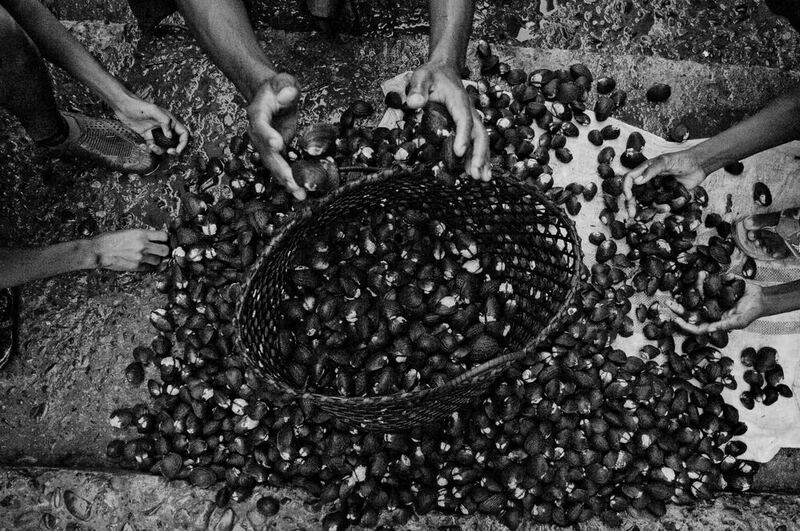 Even though black shells are a culinary delicacy in Ecuador, shell pickers are only paid 8 cents of a dollar per shell. On average, pickers will find between 50 and 100 shells in a day´s work. 2013. Jefferson Muñoz lights blows into a torch made out of coconut husks. The torches blow smoke for hours repelling the vicious mosquitoes and black flies of the mangrove. Bug spray only repels insects for a few minutes after application. 2014. Children as young as 9 years old pick shells in the Cayapas Mataje Mangrove Reserve to contribute to their families´ economy. Although local authorities have made important improvements keeping kids in school, their performance usually takes a toll as they are too tired to do homework or pay attention in class after 5 or 6 hours searching for shells in the arduous conditions of the mangrove. Gabriel Benitez holds up a poisonous toadfish. Toadfish live in the mud where people search for shells. A toadfish sting can permanently deform a person´s hand and cause infection. Soraya Mesa has 9 brothers and sisters, 6 of which pick shells to contribute to their family´s income. 2013. Alex Ocampo sticks his hand in the mud while holding onto a mangrove root and his torch with his other hand. 2014. Shell pickers have traditionally worked barefoot. In the past years, however, most people use rubber boots and gloves to protect themselves from toadfish and water snakes living in the mud of the mangroves. Alex Ocampo walks through a water inlet in the mangrove reserve. 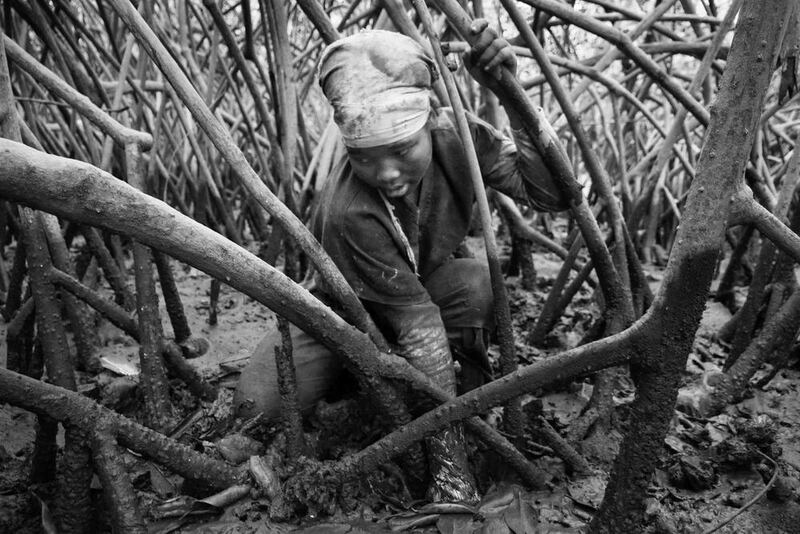 Shell pickers are used to work and walk waist deep in the mangrove. Most outsiders will invariably get stuck in the mud and have to get dragged out. 2014. Cesar Castro and Olger Grueso goof around in the mangrove while taking a rest from picking shells. 2013. A child jumps into the water after a day of work picking shells. 2011. Men gather around a pile of black shells to be sold to middle men in the city of San Lorenzo and then to the rest of the country. San Lorenzo, Ecuador. 2010. A child sitting on a boat looks at the camera. Pampanal de Bolívar, Ecuador. 2010. A child carries a branch of bananas back to his house. Limones, Ecuador. 2009. The life of the communities inside the Cayapas Mataje Mangrove Reserve is harsh due to a constant shortage of water. 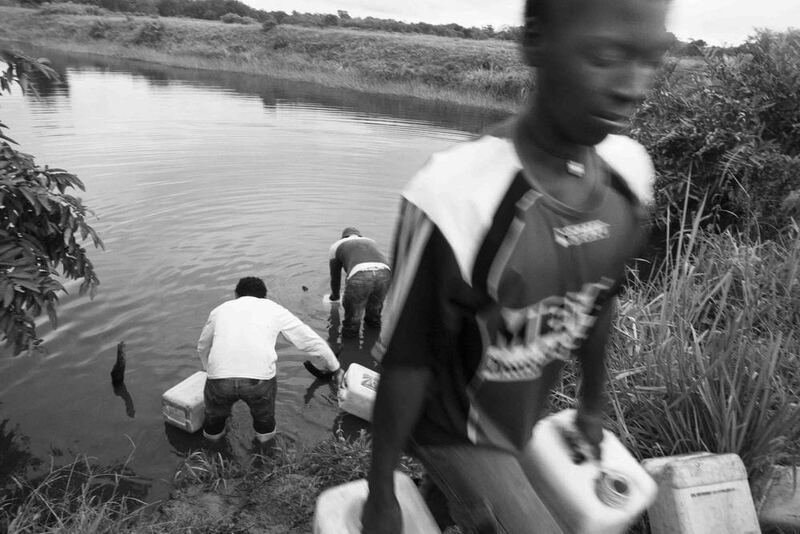 In the picture kids fetch water from a source in a private farm outside the Reserve. Tambillo, Ecuador. 2010. A new born sleeps while her mother plays Bingo with her neighbors. Tambillo, Ecuador. 2014. A woman dances with a baby at a bar in the community of Tambillo. In the communities, Sundays are mostly reserved for drinking and partying. Tambillo, Ecuador. 2014. Children eat breakfast before heading to school. According to local authorities, children make up to 70% of the population of the communities in the Cayapas Mataje Mangrove Reserve. Tambillo, Ecuador. 2014. Haider Sanchez digs through the mud of the mangrove in search for black shells. He has 5 brothers and sisters, 2 of which pick shells to contribute to their family´s income. Julio Banguera has 4 brothers and sisters, 1 of which picks shells. Elisa Castillo takes a break from picking shells in the Cayapas Mataje Mangrove Reserve. 2010. The reflection of Diego Reasco holding his basket and torch can be seen in the water of the Cayapas Mataje Mangrove Reserve. Work days in the mangrove are determined by the ebb and flow of the water. 2014. 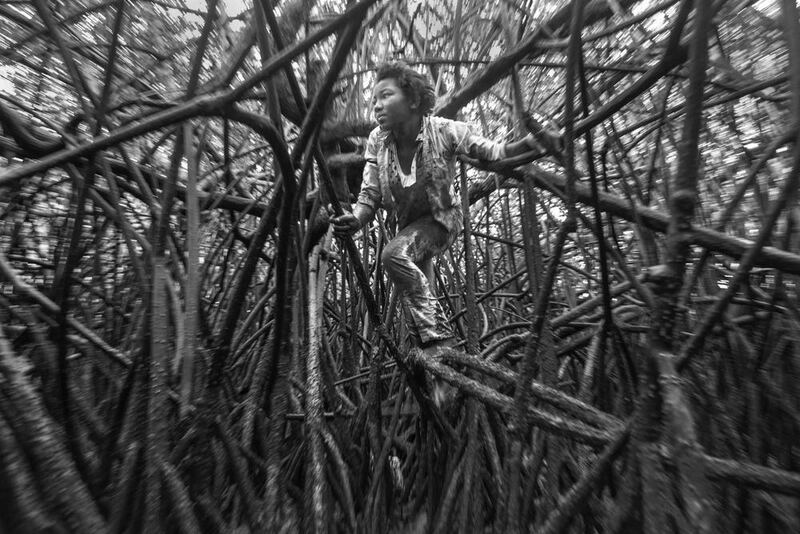 Children climb on the roots of the mangrove in the Cayapas Mataje Reserve. They are the tallest mangroves in the world. Ecuador, 2013. Efraín Montaño goofs around with the black shells he just picked in the Cayapas Mataje Mangrove Reserve. He has 5 brothers and sisters, 1 of which also picks shells. 2013. The mangroves of the Cayapas Mataje Reserve in northwestern Ecuador are the tallest in the world. Their shapes and size are breathtaking. 2014. 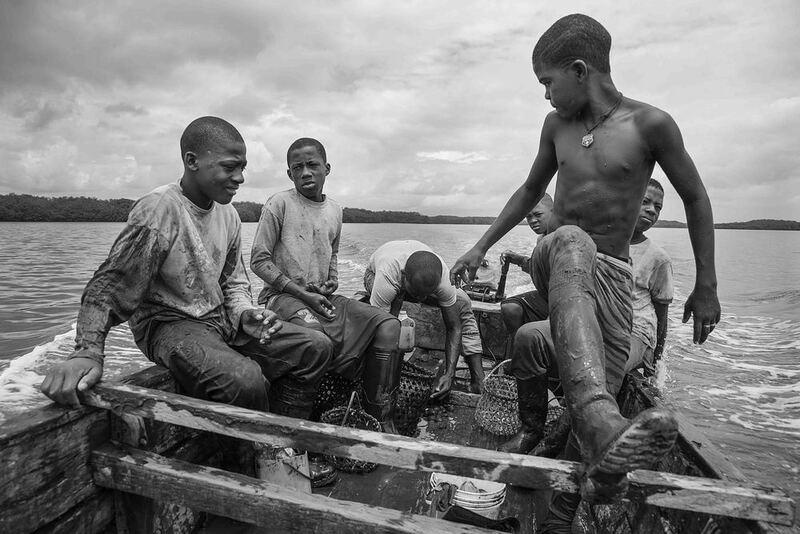 Children play on the roots of the mangroves in the Cayapas Mataje Reserve. Their movements are effortless as if the branches and roots were extensions of their bodies. 2010.